Each sea day on the nail cruise brings different education. Day-two of education, which was January 22, consisted of several different mini-classes with Gina Silvestro. Gina wears many different hats as an educator. She is a distributor and trainer for Akzentz, a Canada-based gel company, and she is an integral part in the creation of official educators for the nail division of Swarovski. The key to making gel-polish last longer is to completely remove the cuticle from the surface of the nail. Make sure your pushers are not getting dull, and if they are, get them sharpened. When using a cuticle removal product, make sure to completely remove all of it or the remaining residue could cause lifting. Use balance point positioning with your e-file for improved control. Stabilizing your hands could help prevent damage. When using an e-file in the salon, education is key. You should keep the natural nail as healthy as possible. One trick to a successful ombre is in the color pairing. If you are only going to use two colors, they should only be one or two tones away from each other. When doing a horizontal ombre only using two gel-polish colors, 1/3 of the nail starts out as the light color and 2/3 of the nail is the dark color. Clean the brush on a palette when graduating to the next color blend, use an ombre brush to blend one line at a time until the ombre is smooth, then work your way gently down the nail. The brush should only move in 1-2 millimeter increments. If you struggle with lifting, coverage, or strength in the sidewalls of a gel enhancement, it is easier to get closer to the edge without touching the skin if you use a small striping-style detail size brush around the edges. I hope you enjoyed this sneak peek into Gina’s class! 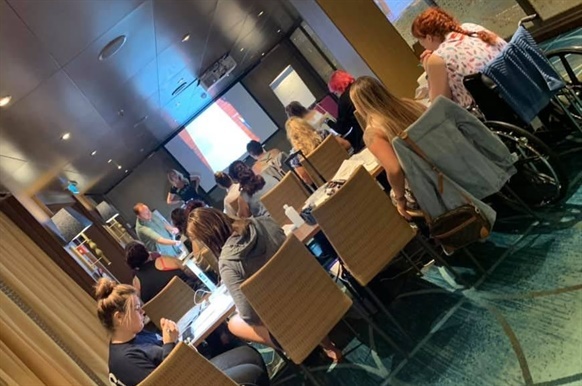 What would you love to learn if you went on a cruise with classes for nails?